Climate change is affecting everyone, even if we choose to believe it or not. It’s extreme heat, drought or wildfires in some places or coastal flooding in others, no state will be immune from the changes that have already started happening to the world. And some, because of their lack of preparation, will be affected more severely. This means you Florida. In a report (click here to access the full report) just released by Climate Central, a group comprised of scientists and journalists, and ICF International, the consulting firm asses the threats to each of the 50 States and their current level of preparedness. It seems like Florida fairs the worst out of all 50 states because of their positioning and the fact they aren’t prepared at all to handle natural disasters related to climate changes. Florida faces all five climate threats, including droughts and wildfires. 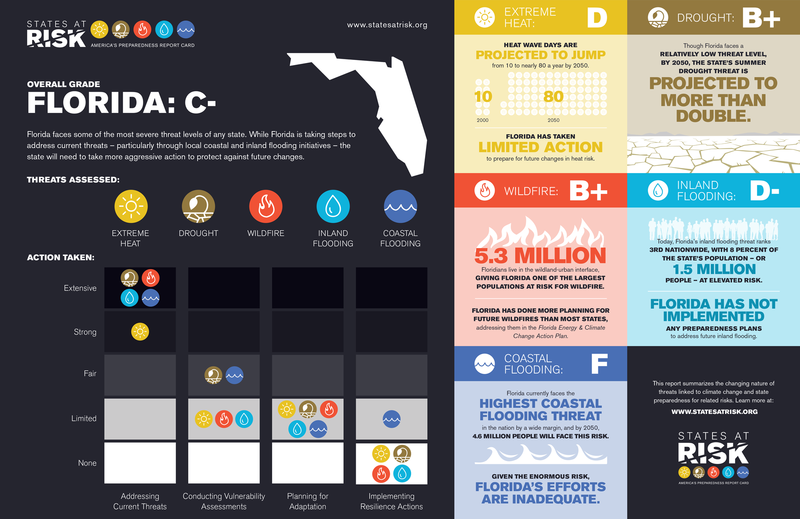 It gets an “F’ for coastal flood readiness and it ranks first in the country for inland flooring and second for extreme heat. Basically if you live in Florida now, you better start making provisions to combat these natural climate change disasters. We aren’t just picking on Florida though, apparently Texas isn’t fairing much better when graded. It faces 4 out of the 5 top climate related natural disasters and its an “F” for its overall level of preparedness. So if you are thinking of moving, or changing climates, it might be time to think again. Check out the report and see where your level of risk and readiness fall, you might be surprised.